Introducing the F-618 Sephrine, a Multirole Aerospace Superiority Fighter. This puts it in the same "niche" as the Star Phoenix. I'm going to talk about this plane not from an in-universe standpoint but from the builder's standpoint, since I'm not up to talking much about how it's better than the other planes. So, the build is pretty complicated, but it ends up looking really good! I accomplished some cool shapes. 1. Two tailfins instead of three. 2. Recoloration of components and engines. 3. Redesigned wings, reshaped, thicker and smoother. 4. Redesigned fuselage, reshaped, more traditional, thinner. 5. Four afterburners instead of two. 6. Redesigned auxiliary thruster system. The Sephrine is a much more satisfactory design than the IDC-Z8J. Interested in hearing your feedback! Aw man, this is my favorite fighter of yours yet. I love that smooth transition from the cockpit to the tail fins! The bottom is a little flat, but overall it's a very good model. Hmmmm... Gonna have to concur with Kojan on this one. While it's admittedly not the prettiest fighter in the PCG-verse, it's one of your best thus far, and has some really interesting snot techniques. Transitions are smooth, wing sweep is nice, new name is a good change of pace... the only major nitpick I have is the engine array, which just looks too small/underpowered IMO. Other than that, well done! Thanks guys! This would have to be my new favorite aerospacecraft as well. 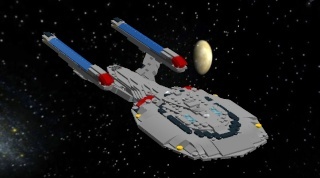 The Star Falcon and Phoenix have evolved well and remain very simple, practical, but aesthetically pleasing builds - this is much more complicated, and I think it's actually quite pretty - but perhaps more aggressive. The rear triangle behind the cockpit, with the silver vents, is supposed to be the integrated dilithium core. The nacelles bulge out under the wings, they have the forward facing transparent blue bussard collectors and those massive exhaust vents at the rear. Additional thrusters are on the upper and lower surfaces of the wings/nacelles for achieving ludicrous speed. Lastly, the black and red component on the underside of the craft at the rear, beneath the fins, is the redesigned auxiliary chemical burn thruster. This thing is so sleek, and so aggressive. It's gorgeous.